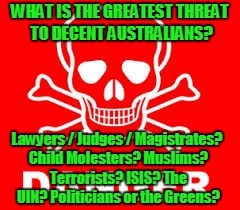 WHAT IS THE GREATEST THREAT TO DECENT AUSTRALIANS? Lawyers / Judges / Magistrates? Child Molesters? Muslims? Terrorists? ISIS? The UIN? Politicians or the Greens?